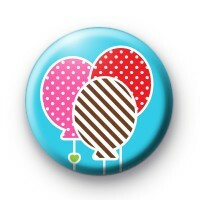 This is a listing for a 25mm light blue badge with brightly coloured and patterned balloons. Everyone needs balloons on their Birthday regardless of what age they're turning. So if you're having a birthday party or just celebrating with family you need to wear a Birthday badge!